Whether you are a professional wishing to attend Protective Behaviours training for the first time, keen to progress your skills as a Protective Behaviours practitioner or become a facilitator of a course for families there are various options. We have a highly experienced team of trainers and all courses are evaluated showing a 99% satisfaction rate and consistently good feedback. Level 2: To deepen and broaden understanding and increase confidence and skills using Protective Behaviours. Facilitator training: to be able to run the evidence-based Families Feeling Safe programme – Protective Behaviours for mums, dads & carers. This is a 2 Day course and you will receive your own Facilitator Manual. Facilitator training: to be able to run the Morris and his friends talk about feelings workshops. This is a 1 Day course and you will receive your own facilitator guidance. We will support you after the training by keeping in touch and providing termly network meetings. Would you like to commission your own training? 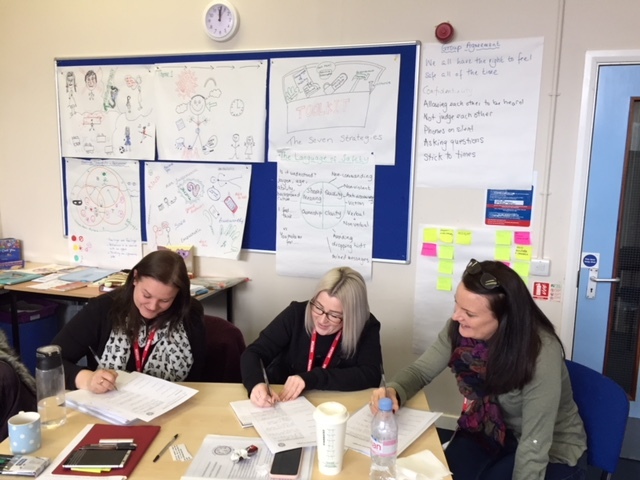 Training for schools can be commissioned as an Inset day, a fantastic way to begin developing a whole school approach. Training can be commissioned by organisations to train their teams ‘in-house’ providing a consistent approach used by everyone. We can deliver Level 1, Level 2 or Facilitator training and bespoke workshops for staff. Are you a school or service who would like a workshop or course delivered to children, parents or carers within your school or organisation? If so, please email enquiries@familiesfeelingsafe.co.uk to discuss specific training, workshops or courses for your schools or organisation. We are proud to have a highly knowledgeable, skilled and experienced team of facilitators who provide our courses and workshops with integrity, written with you in mind. In fact, many parents have helped to shape the content of the courses. Parents and carers give us honest feedback and a high rating of satisfaction and we love to hear about the changes that families have made by attending our workshops and courses. Families Feeling Safe Participant Workbook – written by Fiona Benjamin & Dave Austin, which is available to all parents who attend the Families Feeling Safe programme. I have a renewed passion for Protective Behaviours. I’ve used it in my professional work but recognise through this group I can use it more at home within my own family. I feel Protective Behaviours is the pinnacle of our work, which helps reshape our service on every level with the families we work with because our families can relate to it on an everyday basis. Thank you! I’ve thoroughly enjoyed the learning and discussions. Thank you to the facilitators, it’s been a pleasure to meet you all. Very supportive. I thoroughly enjoyed it and found it all useful and practical. I’ve told others how positive the course has been and how much more confident I feel in myself and my ability to parent. It’s given me practical strategies to try out with my children and I’ve had such a positive outcome from discussing feelings with them. It’s been particularly useful thinking the way I am when the children misbehave and my approach to discipline. It’s helped me feel more laid-back and I investigate the problem more. I found it was very good and lovely to spend time as a family doing activities. It was particularly useful breaking down Teddy’s feelings (Morris) into simple terms to help my son understand. It will help me to use different language when discussing how they are feeling. Also, reminding me that I need to let them know how I am feeling. My son particularly enjoyed the one to one with me. There are a variety of books, videos and curriculum material available for all age and ability groups. In addition, there are materials published by Families Feeling Safe Ltd for parents to use for themselves and with their children. Please see our Resources page here.